Ornamentation and caps are just a couple of the ways you can upgrade your fence. A fence can be a great way to improve your home; it adds privacy and protection but also can help improve aesthetics and make your yard into a safe oasis for your family and pets. However, if your fence is older (and perhaps attached to a neighbors house) you may not be in love with its design nor ready to install a totally new unit. Fortunately, there are several ways to upgrade your fence to help it look great once again. 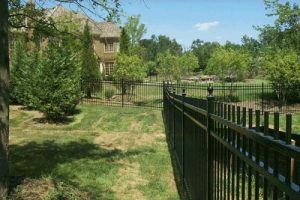 While not all options are possible if your fence shares a border with a neighbor, they all contribute to bringing out the best in your fence once more. Adding lighted post caps to your fence can be a great way to make it look better while adding a functional detail. Lighting your fence can help improve the outdoor ambiance as well as helping to keep your space safer for anyone visiting. Lighted caps come in a wide range of varieties including wood, metal, and plastic and can be set up using traditional power, solar, or even low voltage options. Finding the right decorative accents is a fun way to improve your fence! Depending on your material you may find that you can add a new fence panel with the decorative element. Wrought iron fences, for instance, can be created with the design element built into the fence itself. In other cases you might try a lightweight feature, like a decorative star motif, that can be safely secured to your fence. Note that for elements that are attached, use items resistant to weather damage to prevent any secondary issues for your fencing. Adding a top cap or trim is a great way to improve the look of your fencing while helping it last longer. For many fence types, the top end grains of the fence are the weakest points – they’re open to wearing and can allow the elements to affect the material. When a top cap is applied, it can help make the unit look like new and prevent this type of damage significantly. Adding a stain or paint to a wooden fence is a critical step for ensuring that it lasts as long and as well as possible, and it revitalizes old and dingy posts. With the fresh coat, those who visit your home will think you’ve installed a totally new unit! This entry was posted on Friday, March 22nd, 2019 at 2:41 pm. Both comments and pings are currently closed.